and I rarely see anyone in it. seeing and smelling all the gorgeous roses. 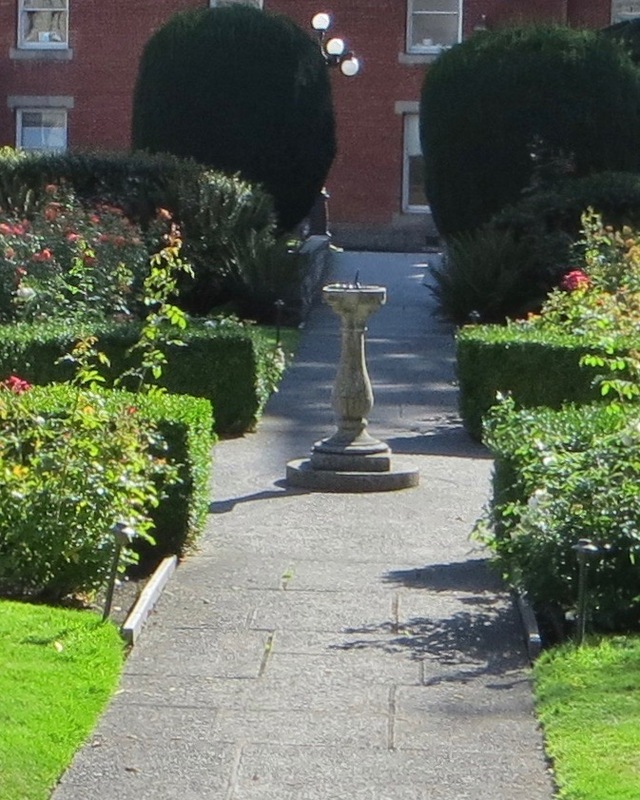 designed the rectangular-shaped garden with its boxwood hedges and central sundial. featuring different rugosa, tea, floribunda, and grandiflora roses. as a relief project in 1935-36 during the Great Depression. 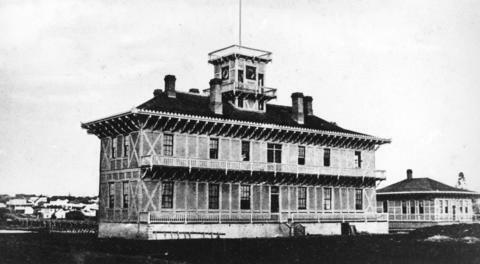 parliament buildings known as the "Bird Cages." 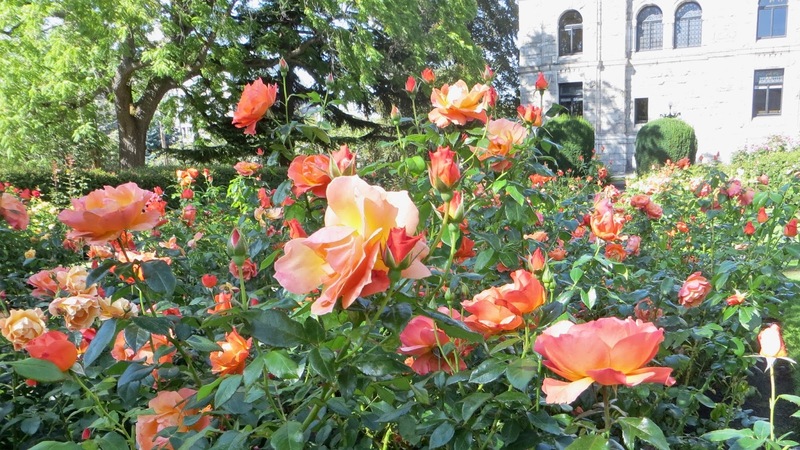 in 1986 and renamed "The Premier's Rose Garden." and hear the sound of honeybees buzzing among the blooms. it's hard to imagine that Victoria's bustling Inner Harbour is only a few hundred yards away. stumbled across Briar Rose's enchanted castle. And you got some amazing photos. That's a rare find. Thanks, Alex! I have a lot of fun playing with my camera and photos. It's also fun to share my photos with others. Have a good one! It's gorgeous! Thanks for all the beautiful photos! Happy Monday, Debra! I know that you enjoy visiting beautiful Victoria too. The Robert Bateman Center is having a free day on Saturday, and I'm planning to go there then. I love our hotel location kitty-corner to the entrance of Beacon Hill Park and kitty-corner to the Royal BC Museum ~ It's the perfect jumping off point to explore the city. Have a great week, my friend! Haha! You were responsible for me staying up way too late last night as I began reading "Delivered." The book is off to a great start ~ Love the warm, loving family feel to the beginning. Well, not Marvin. I'm already hoping that he meets a bad demise. Have a good one, my friend! haha I don't mind taking responsibility for that. Aren't they lovely! 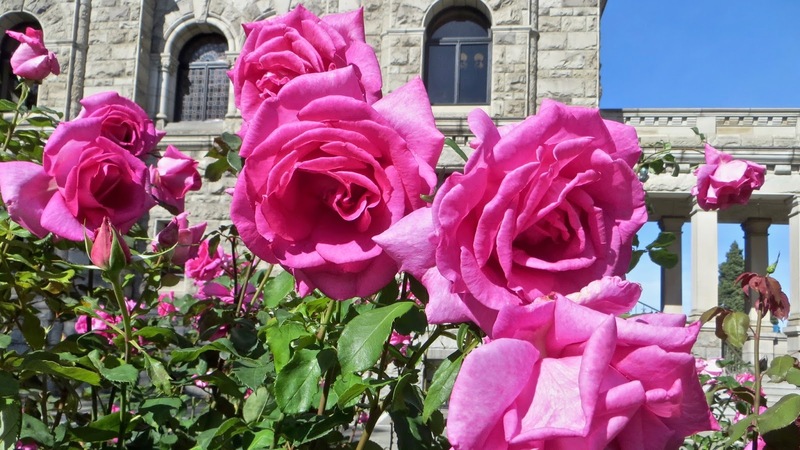 Victoria has the most beautiful flowers of any city I can think of, and its roses are the loveliest of all. It's easy to see so much of the old city and parks within walking distance of our hotel. I think you would enjoy it here, because there is history everywhere you turn. I hope that you and Daisy have a great week. How gorgeous, Louise!!! I thoroughly enjoyed your beautiful photos, thank you so much for sharing, dear friend. Beautiful roses. I'm glad you took pleasure from this endeavour. Nice to have some 'time out'. The building looks magnificent as well, a nice back drop to admire. Take good care. Thanks, Andrew! Victoria is an amazing city to explore with a camera. I just have a little point and shoot Canon, but I have a lot of fun with it. I'd go for a bigger, more sophisticated camera, but I'm too impatient and don't like lugging a lot of things. Have a great day! I don't like lugging things around. I wear a bum-bag for my travelling possessions. Take good care. Have a great week. Traveling light is the way to go! I'm surprised more visitors aren't wandering the gardens. They are so lovely, I can't imagine living close by and not strolling through frequently. 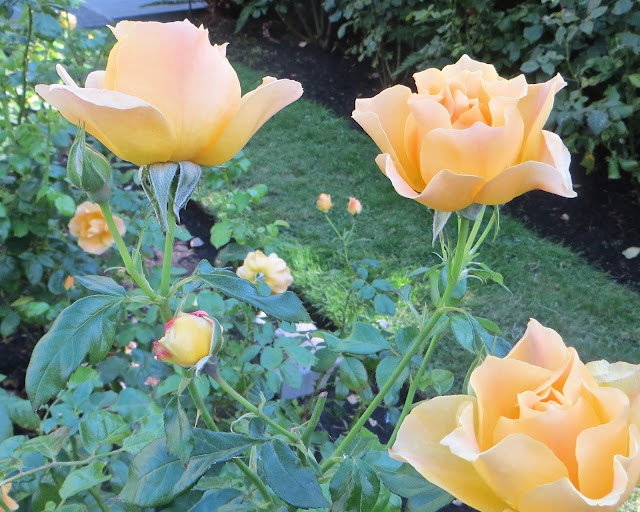 You took some very pretty photos of the roses, I can see why the gardens enchant you. Hi, Teresa! I think the garden is often overlooked, since the main parliamentary grounds are on the other side of the buildings. 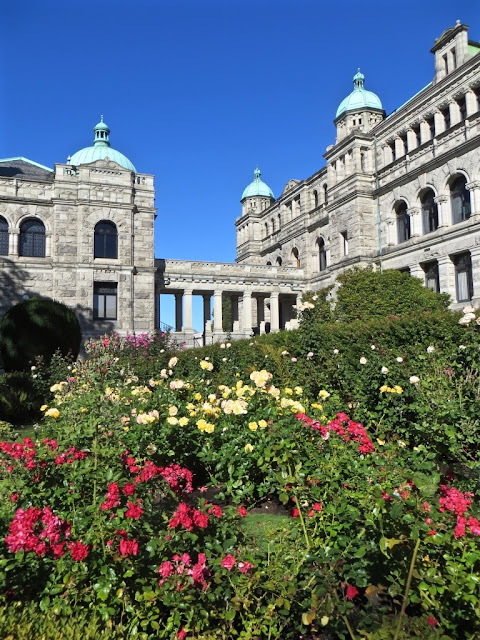 The other side is also where Victoria's busy Inner Harbour is, along with the famous Empress Hotel and all sorts of tourist attractions. I wouldn't have known about the garden myself, if I hadn't cut across the grounds one day looking for a shorter route to my hotel. 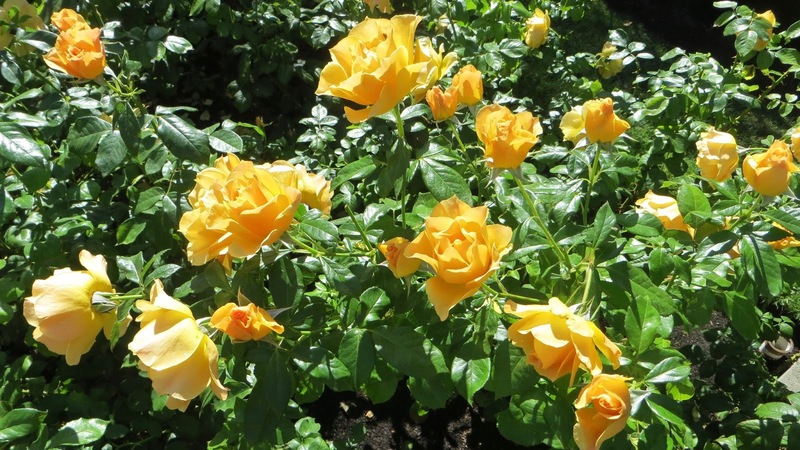 There is very little about the Premier's Rose Garden on line, and you'd have to know of the garden to search for it. It's a shame because the garden is beautiful, and the roses are fragrant. 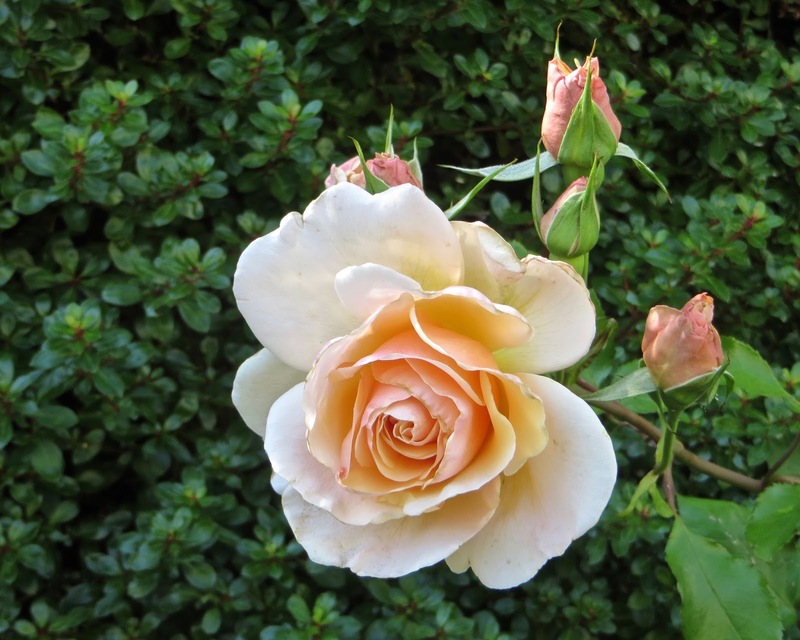 I'll take roses with beautiful scents over showy roses with little smell any day. But because the garden is less well known, I get to enjoy it in peace in quiet ~ Not such a bad thing! Have a good one! 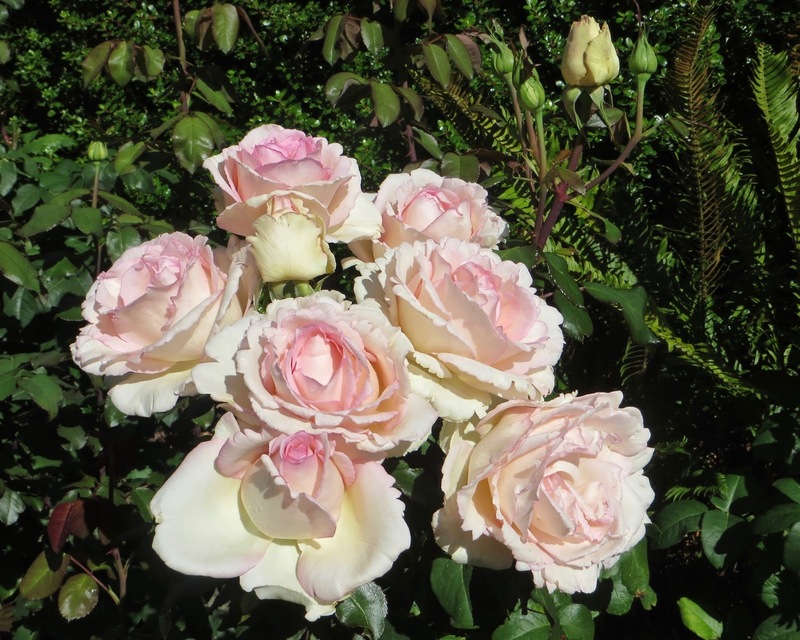 I envy you dear Louise for visiting such beautiful garden as roses are my most favorite flowers since always! you took amazing photos of colorful heavenly place. 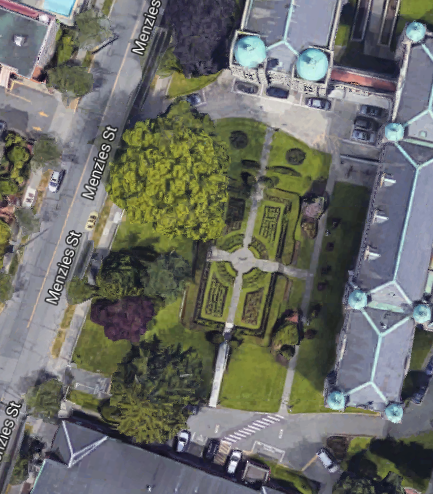 Thank you so much for giving the satellite view it gives perfect view of this quite old garden. 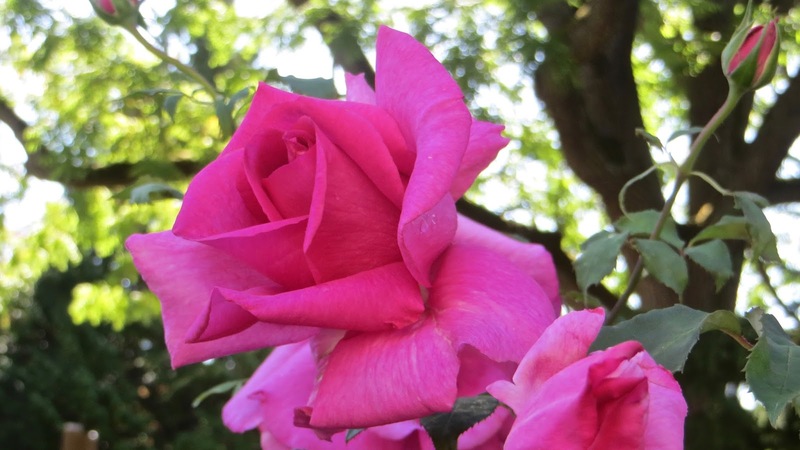 Roses are one of my most favorite flowers too, Baili, along with lilacs and apple blossoms. All three flowers have enchanting scents. I smell my way through a garden, let me tell you. A wonderful imagination is a true gift, and I am happy that you are blessed with one! I was delighted to find the satellite image of the garden to show its layout. 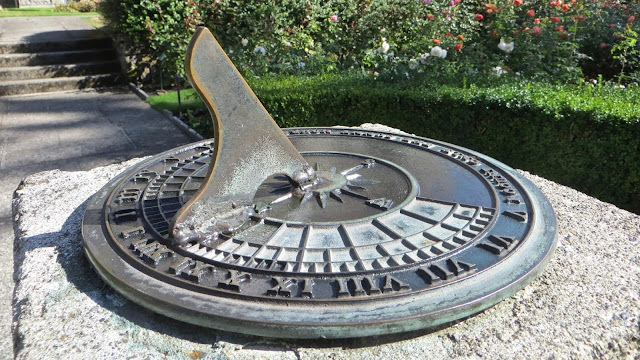 A sundial is an old-fashioned device used to tell time. It has a pointer that casts a shadow onto a clock. The shadow moves as the sun crosses the sky, and the shadow gives a rough estimate of the time. It was about two pm when I took the photo. Of course the sundial only works on sunny days and definitely not at night. Have a good one! Hi, Rain! 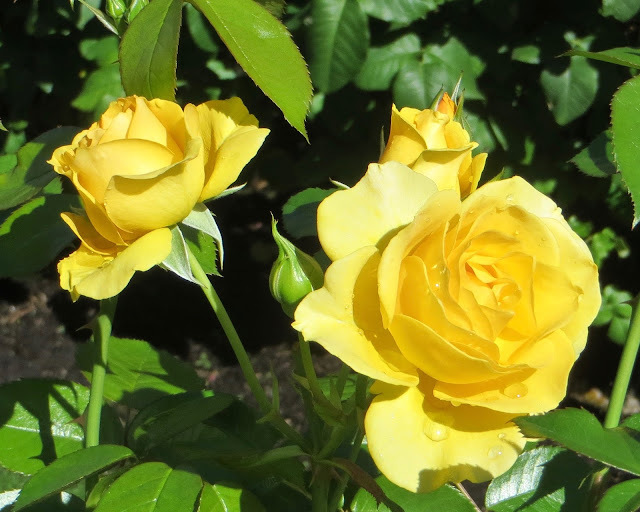 I love roses, and I can't resist taking photos of them, even when I have a lot already. I keep thinking, "But I don't have this rose!" 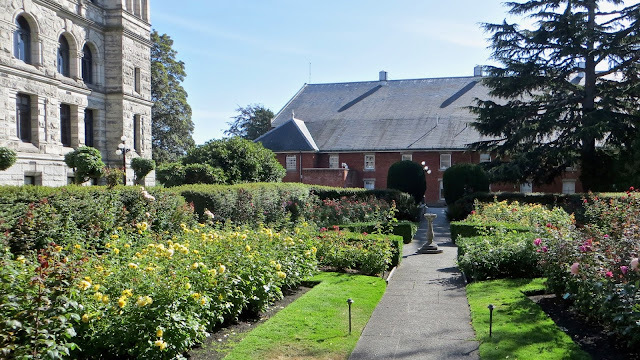 LOL There is another sundial relatively nearby the one in the Premier's Rose Garden. It's down near the entrance to the Ogden Point Breakwater. It's huge and is actually on the ground. You stand on it to cast your shadow to tell the time. It's even adjusted for the months of the year. Sadly, many people walk right by it, and even across it, without realizing it's right there. Have a great day! Oh I would love to walk through that rose garden. The smell of roses just takes me away as if under a magical spell. Thanks for sharing your photos. The fragrance of the roses was wonderful, Truedessa! I'm sure you would enjoy walking there! Take care! Truly gorgeous! Thank you for sharing such beautiful pictures!! Maybe I have to take a trip! Big Hugs! Big hugs back at you, Stacy! I think you're here with me in spirit, because I am running into crows frequently! LOL Have a good one! Many thanks for your latest comments on my post, your sense of observation really stunned me... I hadn't seen how the eye ring has an hexagonal shape... There you truly amazed me!!! I was so mesmerised by its dance that I saw nothing else, LOL!!! That garden seems very beautiful, although too tame for me - !!!!!! 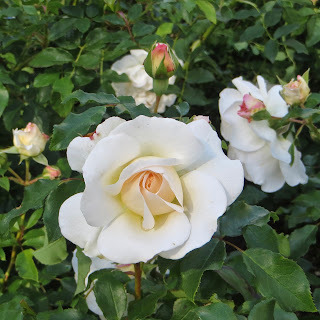 !- and I was wondering how you knew about the names of the roses.... Do they give an explanatory flyer at the entrance ? You must come out of there very light-headed with all these fabulous fragrances and the roses are magnificent. But what strikes me most is the sundial... I don't know why but they fascinate me! After the technology loss of the great civilisations that preceded ours, a simple instrument such as a sundial is extraordinary, simple and precise. Warm hugs and enjoy what ever you're doing!! Good morning, my dear friend Noushka! Thanks for your kind words. I think I noticed the eye ring on the stone curlew because my students and I would hunt for geometric shapes in the world. It struck me as so unusual to see that on a bird. There was no flyer for the Premier's rose Garden, just a two sentence blurb I found online. But the roses were all identified with plaques in the garden. I always like to know the names of things, so I usually photograph the names of things and/or information about them whenever I'm taking pictures and there is information available ~ A quick way to take notes. I learned early in life that I quickly forget details, and if I take a photograph, I want to know years later what and where it was. Have a wonderful end of the week! Sending you hugs and love!